An increasing number of camera manufacturers are focusing and more on the production of compact system cameras as well as high end compact cameras and at same time attention to DSLR cameras is fading and getting reduced to a few major developers such as Canon, Nikon and Pentax. Olympus, Panasonic, Sony and Samsung are among the tech giants whose attention is increasing on the front of compact system cameras and the recent introduction by Samsung of the NX20 compact system camera, seems to be quite promising. 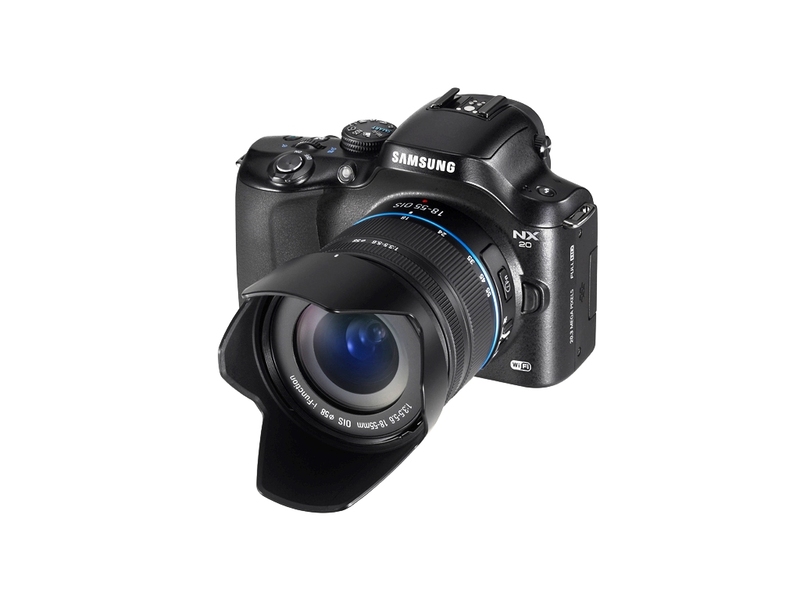 The Samsung NX20 is a successor to the NX11 compact system camera, which came with a 14.6 mega pixel sensor and was not able to exert much influence in the market. 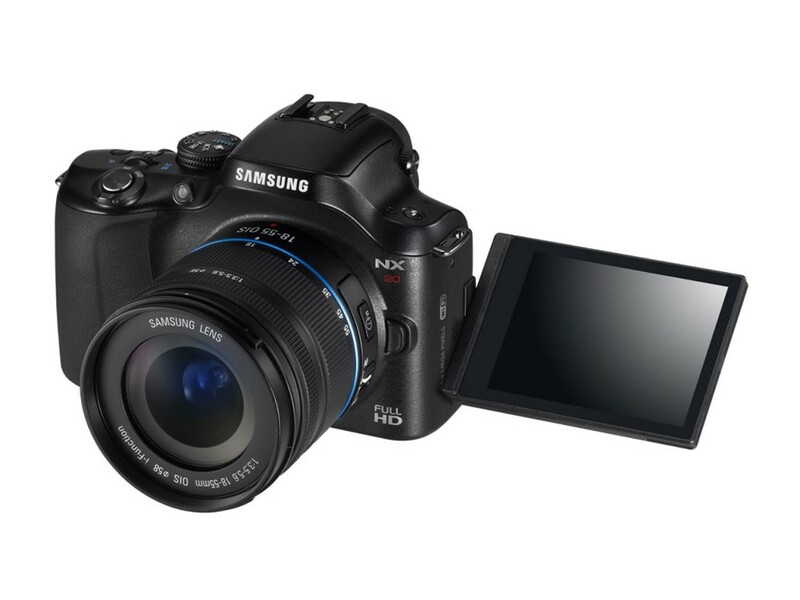 But certain enhancements and distinguishing features of the Samsung NX20 Compact System Camera, such as being the first camera with a built-in WiFi module, make it an important product as well as its 20.3 mega pixel sensor. The physical structure of this compact system camera is not much different compared to its predecessor, the NX11. However, the handle on the right side of the camera has been redesigned which, coupled with the hollow rubber for thumb, provides a firm grip. The 3 inch OLED display at the back side consists of 640 by 480 pixels while the OLED technology makes the display viewable even in intense sunlight. The viewfinder of the camera happens to be electronic instead of optical as found in rangefinder or SLR cameras. However, while it is quite bright and reasonably sized, though not reaching the same standard of Sony NEX-7 compact system camera. The arrangement of buttons on the camera is quite straightforward and provides an easy operation. The shutter button is on the upper side of the handle and behind it there is an adjustment knob which provides an easy one handed operation. On the left side, there is the mode selection switch and PASM modes which also has a custom shot for user-specific settings. There is a dedicated button for video shooting at the top of the back which is protected by a small collar to avoid accidental operation. On the right side, there are two more buttons for exposure compensation and AE lock. There is also a four-way pad which is flanked by four buttons, two of which are used to display the main menu and the quick menu and the other two are used to switch playback mode and delete photos. Features such as quick manual white balance or direct activation of the RAW image can be adjusted with a switch that is present under the lens at the front. The Samsung NX20 Compact System Camera has a very good ability of zooming the photos while retaining sharpness as well as a sensor that provides a good dynamic range due to its 20.3 mega pixels. Besides, it can scroll through multiple images and can also delete several images at a time, a quality that its predecessor lacked. Overall, the user interface and physical structure of the Samsung NX20 Compact System Camera is something that make is quite easy to work with even for amateur photographers. A slight negative point might be that its menus are a bit slow to respond and do not respond well when the camera is engaged in writing photos to the buffer memory. Overall, the Samsung NX20 Compact System Camera is quite an improvement compared to the earlier version from this series and clearly reveals that Samsung has put a lot of effort in the production of creative and leading compact system cameras as seen in the release of the Samsung NX20 Compact System Camera.